First of all, you need to know that there aren’t only 4 reasons for choosing the Pangea Pod Hotel on your next trip to Whistler. We could, for example, speak at great length about how our hotel has a unique social vibe, how you’ll get to meet dozens of likeminded travellers, how sleeping in a pod is an experience in itself, how we’ll be serving exquisite cocktails on The Rooftop Patio, Whistler’s only rooftop bar, and so on. 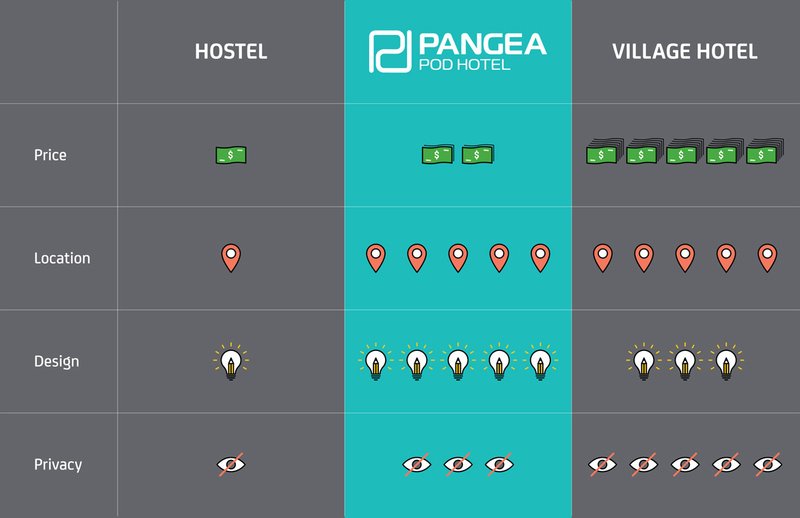 But we know that the 4 biggest reasons for choosing Pangea are far more elementary – attributes that no other hotel or hostel in Whistler can offer in combination: the perfect location, inspiring design, key elements of privacy and an affordable price tag. Only at Pangea will you be able to tick off all these essential criteria. There are no two ways about it: our location is unbeatable. Not just unbeatable for the price, as some hotels and hostels might sugarcoat it, but unbeatable period because you can’t get any better than our position right in the middle of the Village Stroll, Whistler’s main pedestrian drag. We’re in the thick of the action, among plenty of great bars and restaurants, and just a couple of minutes from the gondolas. So not only will you not have to lug your ski or snowboarding gear across town both to and from the slopes, you also won’t have to walk more than a couple paces to Whistler’s famous patios, bars and restaurants in the evening (or to Pangea as you skip, or stumble, home after). Everyone wants to feel inspired by their surroundings while they’re on vacation, right? 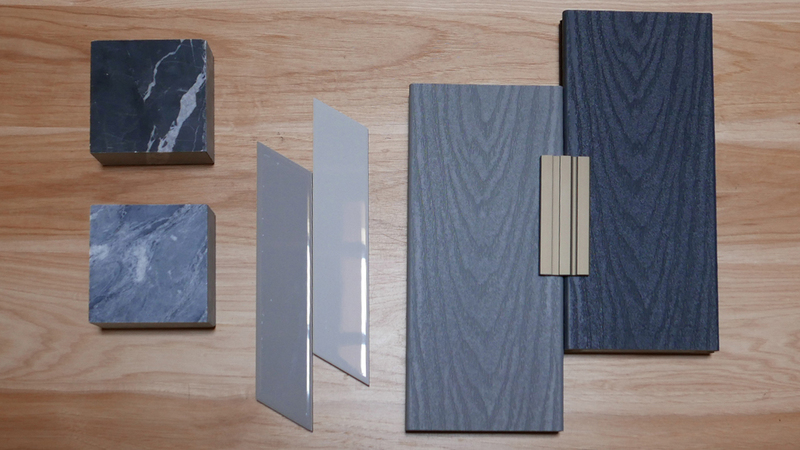 Well, we believe this extends to the hotel you’re staying in, which is why we’ve invested an inordinate amount of time and resources in the design, development and selection of our interiors. From the architectural features to the materials used in the furnishings, everything has been carefully chosen to give you that feeling of comfort and calm satisfaction you only get from a modern boutique hotel. We wanted to create an environment where it’s easy to meet and interact with other like-minded travellers, but we also appreciate that everyone needs their own space. So we designed our pods in a way that gives our guests the key elements of privacy they need. Our comfy double beds are surrounded on three sides by walls, while at the entrance to your pod you’ll find a curtain that can be drawn back at night or whenever you just want to keep yourself to yourself. There isn’t a hostel in town that can offer this kind of privacy, and there isn’t a hotel in town that can offer the kind of social vibe you’ll find at Pangea. It’s the best of both worlds. A central location, chic interior design and key elements of privacy; you’d think all this would come at a steep cost, wouldn’t you? Well, actually, that’s another reason for choosing to stay with us – we can provide all the above for an amount that’s very affordable. In fact, we charge a lot less than a comparably located hotel. So whether price is first or last on your list of hotel criteria, it makes sense to stay at Pangea. 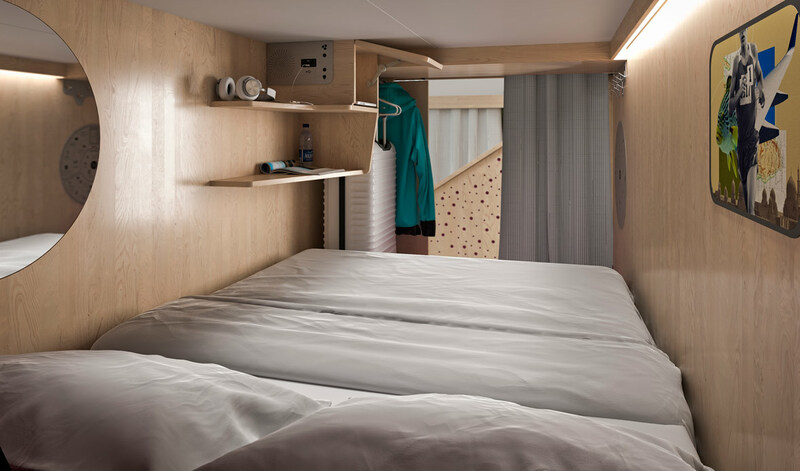 There you have it – 4 very compelling reasons why you should choose Canada’s first pod hotel on your next trip to Whistler. And remember, that’s just the start of it. Stay tuned to our blog and social media channels for more insight and more tips and tricks to experience the best of the unique mountain town of Whistler on a budget.